The town of Torgiano still preserves its typical medieval appearance and the remains of its ancient walls. The Wine Museum is of great interest, containing a precious collection of storical documents regarding various sectors: the art of wine-growing and wine-making, and artistic, folkloristic and bibliografic documentation on the subject. You may also admire a very precious collection of maiolica dating back to th 17th and 18th centuries. 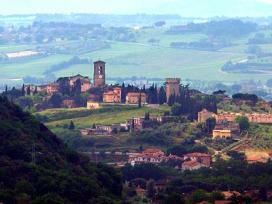 The fortified part of the town is siuated between the middle of the Tiber valley and that of the Umbrian valley. Here, the cultivation of the vine is an ancient art as is evidenced by the testimonial of archeologicals finds, and by a sketch dating back to the 14th century. The zone is characterized by agriculture, consisting in the coltivation of various food-stuffs, and by craftsmanship, above all, the pottery trade. The Museum of Wine is the most qualified in all of Italy, with its collections of tecnical instruments, prints dating back to various times, specialized craftsmanship and folkloristic documents.